I love risottos…almost any kind. They make my heart beat fast. 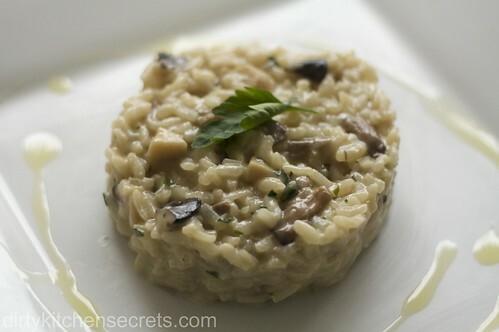 One of my ultimate favorites is a simple, classic mushroom risotto with truffles. I’m a sucker for it. You can get me to do just about anything- laundry, back-bends and I’ll even dance with snakes- for a creamy, luscious bite. I know that some are very frightened by the thought of making risotto and see it more of a punishment than a labor of love. I assure you, it is really easy and once you’ve got the basics down, you’re on your way to passionate risotto making. It’s like when you first started riding your bike, you just need some practice. Fat + Savories (garlic, onion, herbs) + rice + wine + broth + more fat & cheese + sit covered for 2-3 minutes off the flame = one hella-of-a Risotto! When working with the wine and the broth, always ensure that it has evaporated before adding more. Always stir! Always ensure any liquids going into the risotto are warm, as to not shock the rice. That is why the broth is simmered in a separate pot and the wine warmed. Shocking the rice, will make it flaky on the outside and hard on the inside. Risotto takes about 30 minutes total time of hovering around the pot. If you don’t think it deserves that bit of your time then I’m sorry to say you don’t deserve to devour it. I’m allowed to say that since I’ve been assigned duties of risotto police! Do not rinse the rice. Rinsing the rice will strip it of the starches that are responsible for making it creamy. Once you get this basic technique down, you can get creative with your ingredients. Add the warmed wine, stirring it often. It should take about 2-3 minutes for it to evaporate. /4 used, test the rice. Risotto is ready when it’s soft yet slightly al dente. 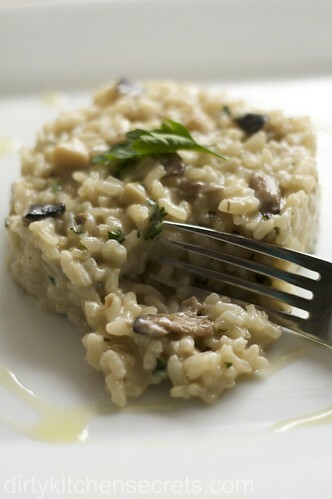 Your risotto is now ready for serving! I love risotto, especially with mushrooms. It’s so fun because you can throw pretty much anything in there. Yours looks great! I’ve said it before and I’ll say it again: I love rice and risotto is tops! This is creamy and delicious-looking; it reminds me that it’s about time I made risotto again. Nice writing. LOVE THE WRITING. I gonna give it a whack. Thank you. I was stumbling for a good risotto recipe and this one looks delicious!! I love the presentation on the dish too. I’ll definitely start referencing your website from now on- it’s great! Made it, followed the directions almost identically except used a substitute for the creme fraiche. Loved it! Such a strong truffle/mushroom taste, creamy and rich without feeling heavy and being able to discernibly taste the fat! Also the directions were vital! Thanks!